At InnoTrans 2018 our Editor, Luke Antoniou, caught up with Torben Østerby, Key Account Manager, DAMM Cellular Systems to find out how he sees the industry developing. Could you tell me a little bit about DAMM and what your doing at InnoTrans this year? How has safety and security changed with the increasing use of technology in the transport industry? What role does DAMM have to play in this? How do you continue to innovate in such an important part of the industry? 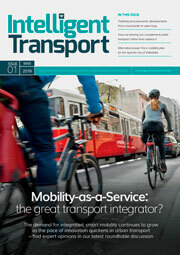 How important is it for transport companies to be able to implement flexible solutions in this space? What is the next area in safety and security that is ripe for disruption? What part does DAMM have to play in that? DAMM Cellular Systems A/S is a world leading provider of scalable, flexible and user friendly TETRA communication infrastructure perfectly suited for public transport data and voice communication solutions. Being a key player for more than 25 years within professional radio communication DAMM is taking the lead in TETRA technology through superior engineering and constant focus on customer needs and reduced complexity. The DAMM TetraFlex® system provides the most cost effective solution, fastest deployment of TETRA infrastructure, easy access to responsive support and the full benefit from leading edge technology. DAMM is entirely committed the provision of infrastructure. The TetraFlex® is fully interoperable with terminals from all major terminal vendors.